I love my husband but sometimes that man needs to remember – NEVER TOUCH ANYTHING IN THE FRIDGE UNTIL I SAY IT’S OK! Only food bloggers can truly understand this unwritten (non-negotiable) rule. It can be a deal breaker. Luckily I believe in forgiveness even after he ate the last of these 5 ingredient Whole30 Hawaiian chicken burgers. So I placed them in the fridge. Totally safe – my husband typically doesn’t touch anything in the containers because he’s either afraid of me, afraid of the food, or has been conditioned by now to know none of his favorite yummies stored in there (like pop tarts or frozen pizza). So we’re good – I don’t have to write sticky notes or draw any big, red X’s. WRONG. Ok, flattery will get you everywhere with me. No harm, no foul. 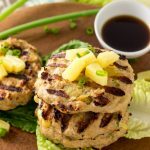 Luckily these 5 ingredient Whole30 Hawaiian chicken burgers are SO tasty, and SO easy, I don’t mind making them again (and again, and again). And I have – very week since I created them. No lie. 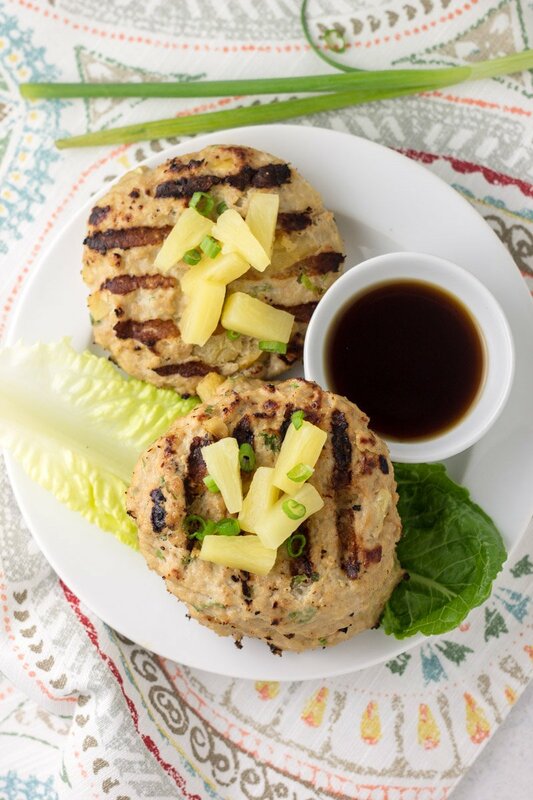 How can you not fall in love with a burger that is packed with lean ground chicken, and bursting with pineapple and coconut amino-infused flavor. The easiest, tastiest, and most unconventional Whole30 burger to grill this summer. What surprised me the most about my husband’s complete off-limits slip is that he loved ’em. WHAT? 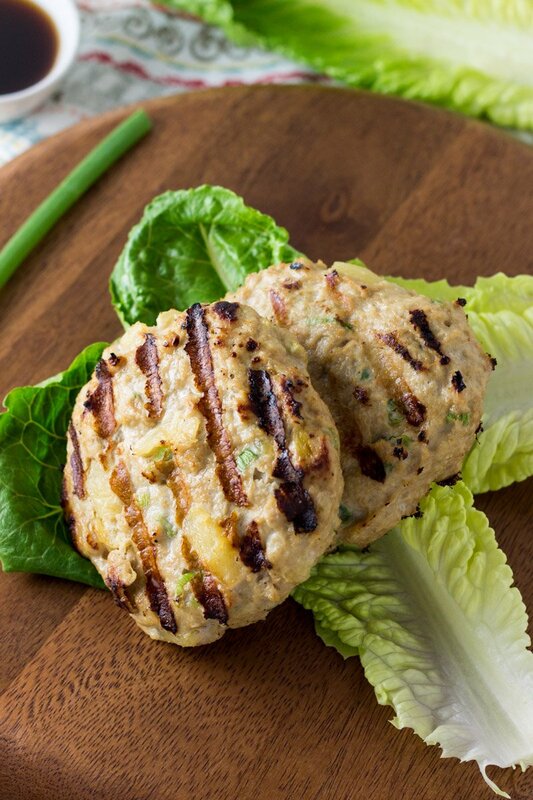 That pizza loving, pop tart hoarding, beef-only kind of guy actually told me he liked these 5 ingredient Whole30 Hawaiian chicken burgers over regular beef burgers on the grill?! Swear on my Whole30 morals, this is true. Jaw droopingly shocked folks. So naturally when this happens, I rush to share, because it’s just really exciting for me. And exciting things don’t always happen ‘in-the-trenches’ kind of daily mom life, so pretend you’re just as excited as I am, ok? Ground chicken can be kind of tricky to handle, but follow the instructions below and you’ll be golden. It won’t be hard to master chicken burgers on the grill when you’ve mastered ’em (after 37th time you make – ’cause they are addicting). Plus these burgers require such little prep effort. What’s not to love? 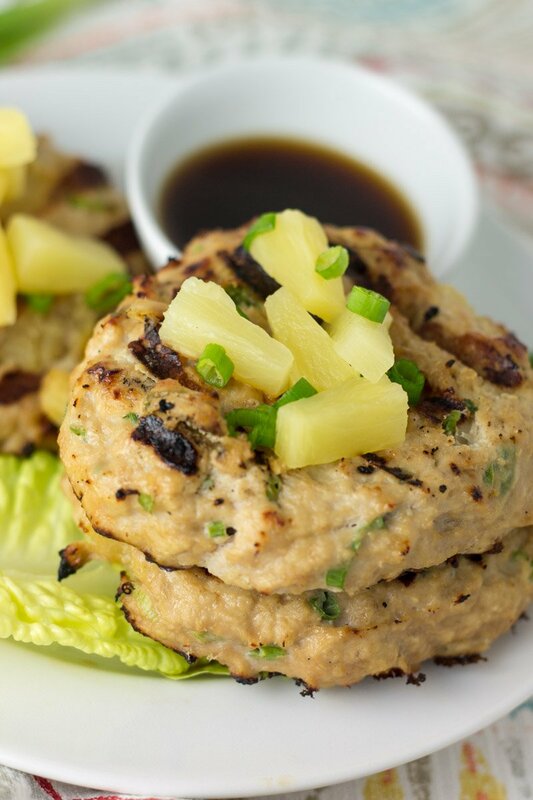 All you’ll need is ground chicken, diced pineapple, coconut aminos, green onions, and almond flour. THAT.IS.IT. Looking for other Whole30 inspiration to get you through all those upcoming summer BBQ’s? Try this Whole30 pina colada cole slaw, roasted red pepper and eggplant tapenade, and this no bean roasted carrot hummus. Note: if cooking on stovetop, add PLENTY of oil to a skillet or pan to avoid the burgers sticking. Turn heat slightly above medium/high and place the burgers into the once the oil is hot (do not add the burgers before the pan is HOT). Sear 2-3 minutes per side then transfer to the oven at 350 degrees for roughly 8-10 minutes until thoroughly cooked. It says ground turkey in the ingredients list. Are they made with ground chicken or turkey? Haha, I have to actually leave labels and notes for my family to eat the stuff I make. If not, they assume that it’s some “weird” creation and would never eat it, haha! Can you substitute something for the Coconut Aminos? Aside from ordering it online, I’m having trouble finding it in the grocery store. Maybe I need to go to a health food specialty store. Hi Susanne – Absolutely. You can sub for regular soy sauce, or tamari (gluten free). If you’re trying to stay Whole30 compliant however, you’d need the coconut aminos. I’ve found that regular grocers usually don’t carry it – so a healthy food store or online would be your best bet. Thanks! Thanks Chrissa! I’m going to try these soon. Ok, these were delicious, but mine ending up being more of a scramble than a patty. Any tips on keeping the burgers together when you flip? Uh oh! Sorry about that Sam. Ground chicken can be SO tricky to work with. Did you oil the grates of the grill well?Just wondering when they fell apart on you. I’v tested this recipe three times before posting, and the addition of almond flour, chilling them in the freezer, and oiling the grates of the grill helped me keep them all together. Curious when they started to get scrambly on you – will better give me some insight on how I can help! I think my issue was I used a grated cast iron skillet. I chilled them a bit longer and used a non-stick pan when I made them last night. Problem solved! Looking forward to cooking them on the grill soon. Thank you for your response. Love your recipes! Ah! I can see how that might be problematic! SO happy to hear they worked out better this time around. Thanks Sam! These look delicious, I can’t wait to try! Any good ideas on some sides to serve with this to make it a meal? You could serve over lettuce, with a steamed sweet potato, or check out my Whole30 Pina Colada Coleslaw. A great way to use up the leftover pineapples! Did you use canned diced pineapple or fresh? I read something recently about pineapple destroying protein in meat or something like that? I used diced pineapple – juice drained. Hmmm I’ve never heard that! Chrissa! Help! I am dying to try these. We tried to cook them tonight on a charcoal grill to no avail. Froze them, oiled the grates, and the burgers still “dripped” through the grates. Like all of the burger. I thought maybe I just wasn’t paying attention and didn’t put enough almond flour, so I went to the store and repurchased all of the ingredients and had the same issue. Even tried putting them in the oven on a cookie sheet and the texture was weird and off and they still didn’t stay together at all in burger form. Any suggestions? I can’t figure out what I could’ve been doing wrong, but this is one of the most amazing sounding recipes ever and I really want to try it! Hi Cristina! OH NO!!! I’m so sorry! I haven’t had that issue grilling these. Ok one quick question – was the grill set on high? Mine is usually over 400 degrees. I’m wondering if they fell apart because the grill wasn’t hot enough? That’s literally the only thing I can think of?? What is the sauce made of that is pictured in next to the chicken burger? Do you know how they do if you let them freeze completely and throw them on the grill unthawed? 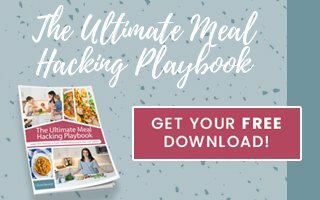 Looking for 100% weekend prep recipes! Hmmm that’s a great question Elisa! I don’t know?!?! But I would assume it would totally work. Let me know if you give it a whirl! I made these with ground turkey and crushed, canned pineapple (fairly well drained) and broiled instead of grilled. Outstanding! I’m always thrilled when a few simple ingredients come together to make something that truly is greater than the sum of its parts! Great recipe. Oh I will have to try these broiled! How long did you keep them in for? Glad to hear they were a hit! Love this recipe!!! 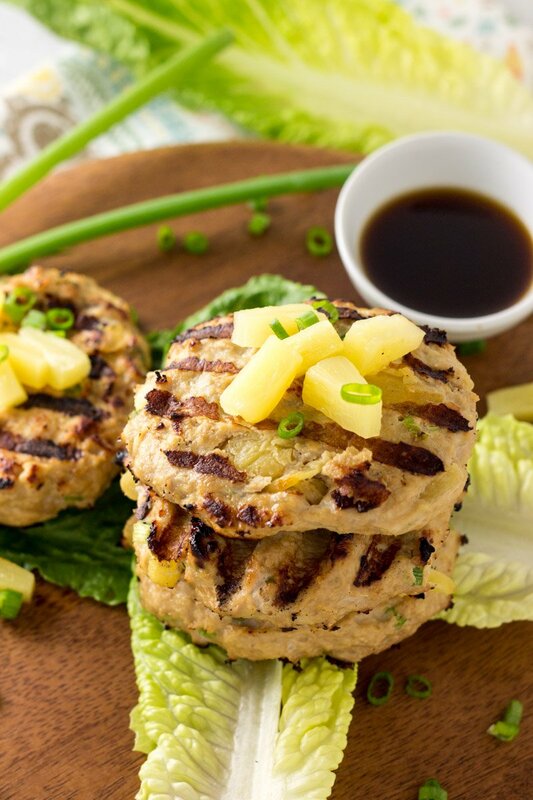 I used ground turkey and crushed pineapple – it cooked perfectly with pineapple flavor throughout. Grilled up great too after freezing patties ahead of cooking, as directed. This is great as a dinner on a plate, or in a grilled red/orange/yellow bell pepper as a bun – if any leftovers (in my house I have to double for any leftovers) – it’s great over a bed of greens with homemade ranch drizzled on top. Thanks for another great recipe (as I’m now cooking another batch of your sloppy Joe bowls!)!! Hey Tracy – so happy to hear you liked it. I’m drooling over all the ways to experiment with these now! If you are on AIP or are nut free you can use tigernut flour, which substitutes very well for almond flour. I also squeezed a lot of the juice out of the pineapple. Also, if you don’t have a grill you can use the oven set at 425 degrees for about 12 minutes per side on a parchment lined baking sheet. They came out amazing, thank you. This is such great info! Thank you so much for sharing! Also a hint, what I often do with my chicken burgers is start them on foil that I oiled; then once they are a bit more solid, slide them off the foil on to the grills. Works like a charm!! Oh man that’s SUCH a great tip!!! Thanks Sara. I haven’t tried them with another sub, but you could try tapioca or coconut flour. I’d add a little more than the recipe calls for if using coconut flour. I can’t guarantee results because I’ve never tried it but I say go for it! Made these tonight with turkey and they were AWESOME!! It was raining so I stuck them in the oven on parchment paper for like 2 minutes and then the rain stopped so I moved them to the grill and they held together great! I think I have to do these with turkey. My burgers was more of a chicken mush. Thought the flavor was excellent and will try again with turkey. I’ve heard of them turning to mush if you use fresh pineapple. If you used fresh, try canned next time. They won’t be mush if you used canned tidbits. Glad you liked the flavor though! Hi! Did you use ground chicken breast or thigh? Thanks! I made this recipe for my family and friends. Everyone loved it! 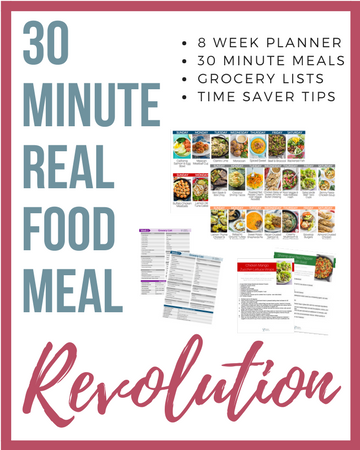 Thanks for the quick and easy Whole30 recipe! I just made these with ground turkey and they’re awesome! Thanks for such an easy but tasty recipe. Served them on a bed of salad leaves with home made mayo – just perfect. I’m a new Insta follower and so glad I found you. Keep up the good work. So glad you liked it Angela. Thanks for your support! I made these tonight and they were a hit with the whole fam! Such good flavor for a chicken burger which is so nice because I’m always looking for an alternative to beef. Also they held together great. Yay! I love your blog and Instagram acct and appreciate all of your food inspo! Thanks so much for your support Shae! Any suggestions if I were to use arrowroot flour instead? Add more or less? Would the flavor change? Thanks for all your hard work recipe testing! Hmmm I haven’t heard if these work with arrowroot. But they do with coconut per my reader feedback! Any suggestions to the flour? Would 1 egg work? Have you tried this? I’ve heard coconut flour works too! Yum! Just made these for lunch! What a good idea. Used coconut flour instead bcs that’s I’ll I had and I loved it. I think it added to the tropical flavours! Thanks for the feedback Kristyn. Glad you enjoyed these! Can’t wait to try as hubby and I just started a W30 on the 1st! What kind of oil do you suggest using to prep the grill with? Thanks. I use avocado oil or even olive oil! I made these tonight and added coriander (whoops cilantro 😁). Omgoodness they were amazing. Have been trying a few of your recipes lately and they have all been delicious! Thanks. I’m so glad you liked these Leah! I will have to try them with coriander! What brand of canned pineapple do you buy for it to be W30 compliant? Thanks!